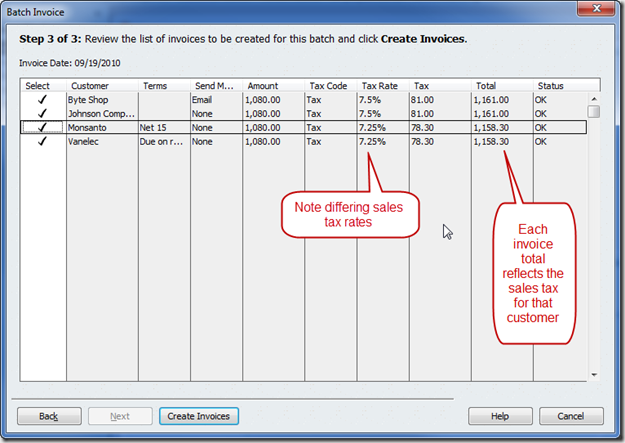 One of the very useful features added in QuickBooks 2011 is Batch Invoicing, which allows you to create an invoice that you can send out to multiple customers in a few easy steps. Let’s take a look at this new feature. Please note that this feature is not available if you have enabled the multiple currency feature in QuickBooks. If you have an invoice that you want to send to multiple customers you can use the new Batch Invoicing feature. Before you start you want to make sure that all of your customers have settings for terms, sales tax rate, send method and email address (if you are planning on sending the invoices via email). 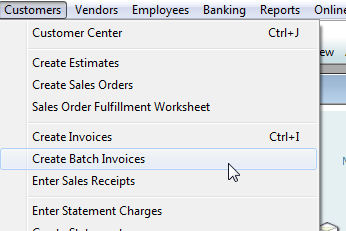 Select the Create Batch Invoices option from the Customers menu. In the first screen you will select the customers that you wish to send the invoice to. Double click on a customer in the list, or click the add button. I’ll address “Billing Groups” a bit later. The second screen is used to select the items that you wish to add to the invoice, along with some common features such as the invoice date, customer message and template. 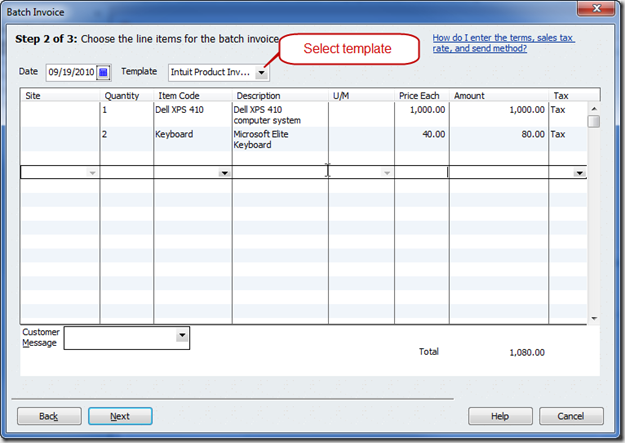 Note that when you select the template the columns that are displayed in this window will change to match that template. This includes the custom fields that you have added as columns. The final step is to review the invoice information by customer. You can decide to drop a particular customer from the list if you feel that there is a problem. Note that the program is displaying the terms, send method and tax rate/code for each customer. Click Create Invoices and QuickBooks will generate the invoices as listed. A summary window opens that will show the results. This is not a method to manage recurring or contract invoices, where you have an amount that you are going to send each month until a contract amount is met. That would be a nice enhancement, perhaps they’ll address this in the future. 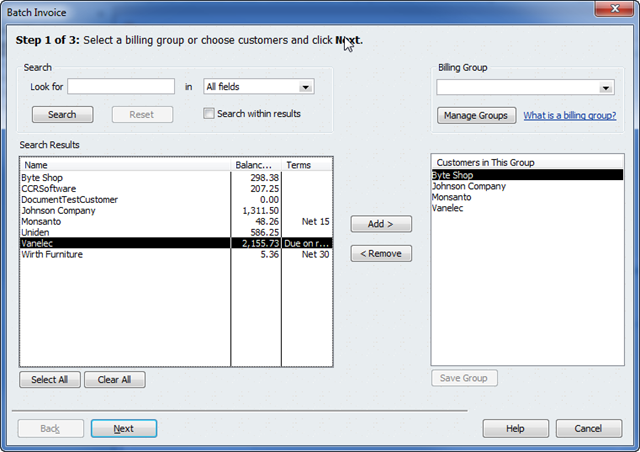 You have the ability to set up Billing Groups in this function. 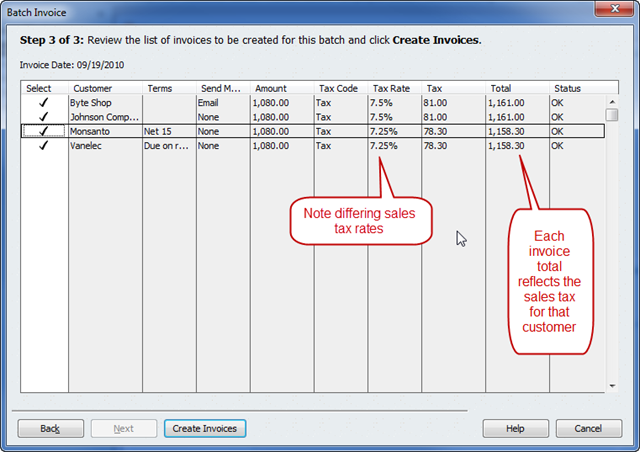 This allows you to create groupings of customers that you would want to use when creating a batch invoice. In the first screen you select the customers to add to the group and then click the Billing Group dropdown. Select Add New and create a name for the group. Once you have created a group you can create invoices for them. Note that you want to create the group name before you select the customers, as the list of customers is cleared when you create a new group name. Create the group name, add the customers, click the Save Group button to save the customers that you want to have in that group. Very nice! Been needed for a long time for certain type businesses and organizations. Thanks for the always helpful info. Thanks, for sharing, you always have great information to share about QB’s. I find your blogs highly useful in my own eduction and then for my clients as well! Your blog is great!! I will be here often. Unrelated .. . what are you using to get your screen captures? I do graphic design, lots of writing/blog posting, etc. so always curious as to what others use. I’ve used Snagit by techsmith for years, but since getting my new Windows 7 system, i haven’t put it on yet (I’ve been using the built in “snipping tool” but it’s very limited.) Snagit is great, but just curious. Back to this post – it looks like QB 2011 will be worth me upgrading, based on this feature alone based on how we process invoices (I do them bi-weekly so the work piles up.) Thanks. Blake, I use the most current version of Snagit, and it works very well for me in Windows 7. From what i Understand though in order to use the Batch Invoicing. You must be billing all the customers in a certain group the same amoutnt before sales tax correct. Vicki, yes – but you have the ability to edit individual invoices after creating them, before you print or email them. I just discovered your blog today and it is a virtual treasure trove. Thank you for all the great information that you give. I know that you said Batch Invoicing should not be used as a Recurring Billing solution. I agree, however I have been searching high and low for a solution for this and have as yet to find one. I currently use Memorized Transactions (in QB 2008 pro – upgrading to 2011 at the end of December). Although this works, it’s really not very elegant. I have customers that pay for their services annually and others that pay monthly. All customers need to know what service dates the invoice covers. I’ve tried adding a date column to the invoice that increments each time the invoices are run, but it isn’t working correctly. SO, long story short. Do you have any ideas for me? I’m really surprised that no developers have addressed this issue yet. (I apologize for getting a bit off topic here, but I’m at my wits end.) Thank you for what you do and keep up the great work! Jeana, you can look at this utility: http://www.q2q.us/idoverview.htm – but that might not be what you are looking for. That probably is more like the Batch feature in QB 2011. There may be others in the Intuit Marketplace, but I’ve not worked with any. The “date” column, is that the “service date” in your memorized transaction? Charlie, Like Jeana I am appreciative of all your info. And also like her, I upgraded to 2011 b/c of batch invoicing hoping that it would include a service date feature. For example, a have 10 amt of customer that pay $20/mo but each will have different service dates ( 1-3-12 to 2-2-12 and another customer will be 1-7-12 to 2-7-12) and therefore a ‘custom’ invoice needs to be updated every month even on the memorized invoices with a range of dates. Anything you know to solve this? Lindsay, batch invoicing is set up to send out the same invoice to a lot of people. That is different than what you are talking about. Look into memorized transactions – the service date column will update, usually, each time you generate a new invoice. That might not fit your service date RANGE requirement, though. I recently upgraded to QuickBooks 2011. I was very excited about the batch invoicing option but I can’t seem to get it to work. I do not have multicurrency enabled but the batch invoicing option is not avaliable to me in the customer drop down menu…… any thoughts on why?? Miranda, from your email address, I’m guessing you are using the Canadian release? Unfortunately, the Canadian version differs from the US version, and it tends to be a year (or so) behind the US version. If they are the same amounts each month for a particular customer, you would normally use “memorized” transactions. Create the transaction for the customer, “memorize” it and set it to recur monthly. Do that for each one. Stuart, I would look into either “group items”, or “memorized transactions”. Depends on the details. You can create a group item that has your common elements, then add it to the invoice to include all the items of the package at one time. Or, you can create a master transaction, “memorize” it, and then use that memorized transaction as a base for new ones. Just moved my company from Simply to QB Pro 2011. Starting to breath again, but, When making invoices in QB the date keeps reverting back to todays date even when I set preferences to use the previously entered date. Any help? I also do NOT have any “create batch invoices” line in my customer column. Lane, sometimes the dates work that way. I’ve never seen an explanation, and never had my hands on a system that did that, so I can’t say much. Try creating a new company file from scratch, instead of the converted one, see if that makes a difference. As far as “batch invoices” – from your email address I’ll assume you are using the Canadian version? Unfortunately, all the info here applies to the US version. The Canadian versions are always lagging behind the US version for new features. Don’t know when (or if) you’ll get this feature. Just new to QuickBooks Easy Start 2011. I am trying to email invoices but am having no success whatsoever. Any suggestions? Lisa, sorry, we never work with Easy Start. You should try the Intuit Community Forum for help with that. I am using Quickbooks plus 2011 – 2012 and the option of Batch invoicing does not appear in my customer drop down menu…can anyone help? Emma, I take it that you are using the Australian version? In that case, a lot of the new stuff I describe here won’t apply to you. I write about the US version. The Australian version is very different. Intuit licenses code to Reckon in Australia – they do whatever the want to do with it. At the very least any new features up here would take a year (or more) to get down there. Often, unfortunately, features never get implemented down there. And, when you look at add-on products, you will find that many don’t work with the Australian version, because they decided to do things differently down there. Sorry! I want to rebill my customers that did not pay on the first invoice but I do not want to create another invoice on their account. I simply want to rebill. Can this be done in the batch invoicing? Mary – batch invoicing will create a new invoice each time. For rebilling – you just want to send them another copy of the existing invoice? You can do that one invoice at a time, just clicking the print or send button. If you want to do that in a batch, the question would then be how you want to SELECT those to be sent another copy? Hi, can get some suggestions? We want to start using quickbooks to track our member subscription invoices that are billed once a year and another notice every quarter have not paid. Now there are different levels of subscription which the would pay different amounts. What is the best way to set this up. I am going to import all the customer info but the big question would be how to set up the invoicing. And also how much can you customize an invoice? Currently they look alot like letters. Any suggestions and guidance would be appreciated. Cheryl, that is a bit more than can be answered easily in a blog comment. And I would need to know a lot more about your subscriptions. “track” is a loaded statement, as that can mean many different things. Hi i just want to be able to create the invoices every year for renewal. Is there recurring invoices that can be set up annually and that can be reprinted quarterly if they have not paid? Also is thereva away to create a very custom invoice? We dont want it to look like an official invoice more like a letter. Cheryl, you can customize your invoices by clicking the “customize” button in the upper right (it might be hidden, if there is a >> button click that). You can “memorize” invoices and have them repeat on a regular basis. Winston – batch invoicing gives you a single common invoice to send to multiple customers. That wouldn’t work with timesheets, because you aren’t applying the same timesheets to every customer. Each should be getting a unique invoice. QB has Customers>Invoice for Time and Expenses. This has to be set up under the Edit>Preferences>Time and Expenses. Hello, I have two customer types (lets call them type “A” and type “B”). Type A is billed (invoiced) $60 quaterly. Type B is billed $25 monthly. All the customers from each type are in as memorized transactions to repeat the invoicing process. If I were to purchase QB’s 2012 and try batch invoicing to raise or lower the invoice price collectively for customer types A and B, is there a way to over wright my current memorized transaction list to reflect the new invoice pricing? Or would this have to be done manually? In other words, is batch invoicing a one time thing with no way to automacilly repeat it unless you individually memorize the new invoices created from the batch process. If true, this still may be better then editing both the price and the memorized transaction one by one. Atleast batch invoice will get the pricing part done for me……Any thoughts or help would be greatly appreciated!! Would using batch invoicing to manually bill every month and quater be the wrong thing to do?? Manually editing the price for a group of 950 customers with the same price one by one really seems wrong! Tommy, Batch Invoicing has no relation to Memorized Transactions. If all of your “type A” customers get the same exact bill – they all are charged $60 (or whatever), then Batch Invoicing works. It is a way to generate the identical invoice for all of the customers you identify. It doesn’t work in situations like a utility company where everyone gets a bill each quarter, but the amount varies from customer to customer. Thank You for the quick response Charlie. My question really is centered on getting the process to repeat monthly or quaterly. If batching is not assiciated with memorized transactions, then must it be repeated manually each month? And therefor must I delete all the memorized transactions I have created to prevent double billing. Also, from your screen shot “Step 1 of 3” I do not see a way to search for customers by “Customer Type”. Is “Customer Type” included in the search section, “look for” [______], “in”[__all fields__]drop down menu. Type isn’t a serch field specifically, but you can add “Customer Type” as a column in the “search results” display – then sort by that column – then pick a range of customers that have that “type”. Yes, if you use batch invoicing to handle these customers then you would need to delete the memorized invoices. Thank You VERY much for your help Charlie!!! I’m working in Quick Books 2010 and want to know if there is a way to run a puchase order batch for a project or job? Or do I need to manually enter each purchase order separately. Doug, I’m not sure what exactly you are looking for here? I’m trying to set up QB2011Pro for a 200 family educational co-op. Each family’s invoice will be different, but for that family, the invoice will be the same for 8 billing periods. I have two questions. 1) Is it possible to set the invoices up over a few weeks and then send them all on the same day? 2) Can I set up a batch for each family? It will mean I have almost 200 batches. If yes, when a student adds or drops a class, thus changing the invoice within the batch, will I have to delete and resubmit the batch or will changing the invoice be enough? Bobbi, when you create then, you don’t have to print them right away. You can leave them marked as “to be printed”, and then you can use the batch print facility to print all of the ones that you have created, at a later date. This isn’t really set up for the kind of billing you talk about. This is designed for situations where a group of customers will all get the same invoice. 50 people that you bill the same about for. When you have individuals that have different charges then you are talking about a different situation. 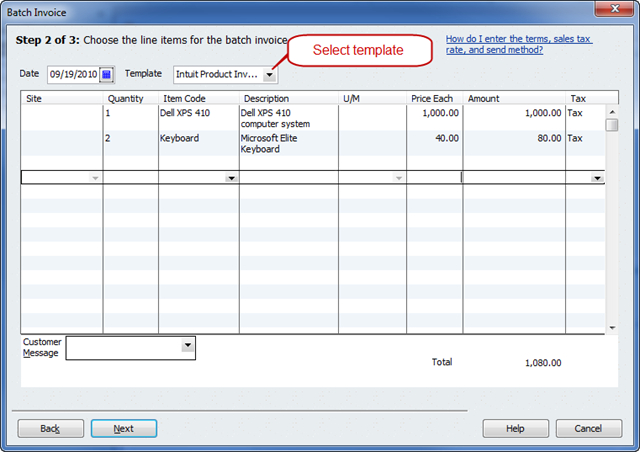 However, if you use the batch feature, you have the ability to alter any individual invoice before you print it. Is batch invoicing the same in QB12? I have 50 customers that have the same totals due, however there is a monthly amount to be paid, should I use batch invoicing, however there are 3 different categories to be paid, ie tuition, books, and fees. Should I make 3 seperate invoices for each customer? Crys, the feature is pretty much the same in QuickBooks 2012 and 2013. Batch invoicing is designed for sending the same charge to a group of people. If everyone has the same fee, this works. But if each customer has a different fee structure, this won’t work. For that you may want to look into Memorized Transactions (if each person gets the same fee each time you invoice, but different from other people). It all depends on what your fee structure is like. Unfortunately, all the invoices created using this method don’t have the box checked for “allow online payment.” Is there some setting I am missing? All the manual invoices I have created previously have this box checked automatically. Brett, with QuickBooks 2011 I’m not sure you can control that. However, note that QuickBooks 2013 has better control over these features. You can set a global preference, and you can set individual preferences per customer to override that. Batch Invoicing in QB 2013 uses those settings. Charlie, is this option available with QuickBooks Online Plus? I have a client (a Chamber of Commerce), who has over 500 members and doing annual dues invoices can be quiet time consuming and I would love to be able to do batch invoicing, but can’t find anything similar to what you outlines above with QB 2011. Thank you! Jennifer, QuickBooks Online does not have a batch invoicing feature. Im trying to print multiple invoices from memorized transactions in order to safe time instead of openning one by one and then save it and print it… I need to know if there is a way to make it faster. Unless you have the memorized transactions set up to automatically be created (using the “automate transaction entry” option) there isn’t a simple way to create multiples at a time. You may want to play with the automation feature to see if that works. Controlling the “to be printed” feature should help – although QB sometimes is a bit funny about that. If the original transaction has the “to be printed” flag checked when you save it, then you don’t have to print each individually after it is created, you can use the batch print feature. First, thank you for all your wonderful wisdom with the Quickbooks program. You are, indeed, the QB master! Congrats! Hopefully, you will be able to assist me with a minor issue regarding batch invoices. I am using Quickbooks Pro 2013. I am super new to this version. Furthermore, I know nothing I can do to correct this mistake. I would greatly appreciate your assistance. Stephanie, there isn’t a batch way to correct this. You can either manually adjust them all, or ignore this, or go to a backup you created just before the batch process and redo it with the right values. No simple fix! I have several very large billing groups and I need to confirm I have the correct customers in each group. is there a way to print a report or at least get total number of members in a billing group?